Successfully Added Levitating Bluetooth Speaker – Bluetooth 4.1, 5W Speaker, 10 Meter Range, 800mAh Built-In Battery (Silver) to your Shopping Cart. With its beautiful design this floating Bluetooth speaker brings a truly unique way to listen to your music. In a world full of Bluetooth speakers why not get one that stands out from the crowd. 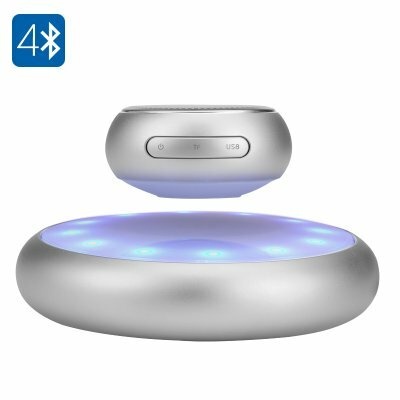 Floating a couple inches above its power base this magical mini speaker is a real eye catcher and sure to draw admirers from all around as it plays your favorite songs while hovering in the air. With no wires, cables or black magic this speaker uses a cleaver combination of magnets to achieve its gravity defying feats and will be the focal point in any room. The flying saucer like speaker brings 5Watts of audio excellence and comes with a built in speaker and hands free functionality so you can use it to take calls in style. Connecting to your phone via Bluetooth 4.1 this energy efficient speaker established a strong and stable wireless connection up to ten meters away so you can stream your favorite songs from your Smartphone, tablet, laptop or other Bluetooth enabled devices. Alternatively play music direct from the speaker itself using the micro SD card slot. With a built in 800mAh rechargeable battery you can enjoy up to 8 hours of play time and this mini speaker can be sued without its magnetic base station to bring you portable music on the go.